The Avalon Underwater Cleanup is the granddaddy of them all. It is the oldest of its kind, now in its 21st year. This year the event takes place on Saturday, February 24. But what makes this underwater cleanup special is more than just its age. More divers participate in this underwater cleanup on a consistent basis than any other event of its kind. Typical participation is around 500. 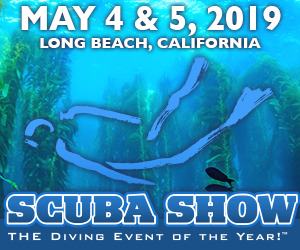 Entire dive clubs participate. A party atmosphere prevails and not only do divers get together to get wet, they also do some heavy socializing. This cleanup is also special for its location, conditions, and targeted trash. First, the location — Avalon is a special place to visit even if you never plan on diving. It’s quaint, small, relaxing, and warm. And diving in Avalon Harbor is permitted only on this one day of the year. 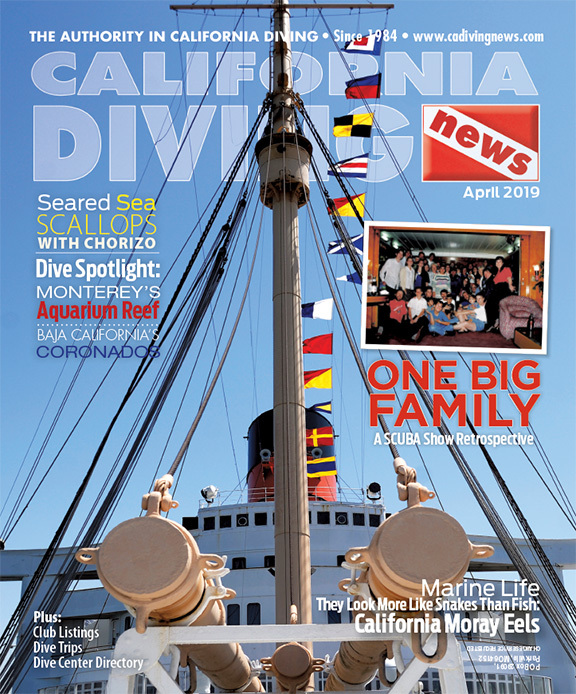 Now harbor diving is rarely excellent, and there are definitely better places to dive around Catalina Island, but for harbor diving, you can’t get much cleaner and clearer than Avalon. Visibility is rarely less than 20 feet and often up to 40 feet. As with any cleanup, picking up trash is the objective of this underwater cleanup, but here objects desired by divers seem to go a bit farther. The Avalon Harbor is heavily used by pleasure boaters throughout the year, especially during the summer. Anything, it seems, that can make it on a boat, makes it to the bottom of the harbor. From the curious to the grotesque, heavy, light, big, small—it all can be found here. Some of the notable items include slinky lingerie, full bottles of liquor (sometimes of old vintage), old coins (the Avalon resort dates back to turn of the century), anti-aircraft and machine gun bullets (Avalon was used as a military base in WW II), jewelry, entire wallets (credit cards and cash, always returned if possible), outboard motors, cutlery and dishes (again, often very old), tools, electronics (always ruined), and much more, from valuable to worthless. Here, I have to brag a little. While I have not been to all the Avalon cleanups, I’ve only missed a couple in the last dozen years or so. In that time I’ve won a few of the awards—the Golden Treasure award last year for finding a Texas AM sold gold man’s class ring (owner still not found), “Visited All 4” Award (for diving all 4 stations, now against the rules, by the way) and the coveted Ken Kurtis “Silver Tongued Devil” B.S. Award. I’ve been around the Avalon Cleanup block. I’ve learned by both experience and observation on the best way to approach the event for fun, ease, and results. Most travelers to Avalon get there via Catalina Express ferry boats. While these excellent and fast boats welcome divers and their gear, why should you drag your tanks and lead to and from the boat and around Avalon? Rent the heavy stuff in Avalon. Tanks and weights are readily available in Avalon, but because of the large number of divers visiting for the cleanup, it is best to call and reserve your gear ahead of time. Renting gear may add to the expense of your trip, but the backaches it saves are well worth it. If at all possible, come Friday afternoon and spend night or two. Hotel rates are quite reasonable in February and cleanup divers often get special discounts. Spend Saturday night and all day Sunday as well. This will also allow you to make several dives. 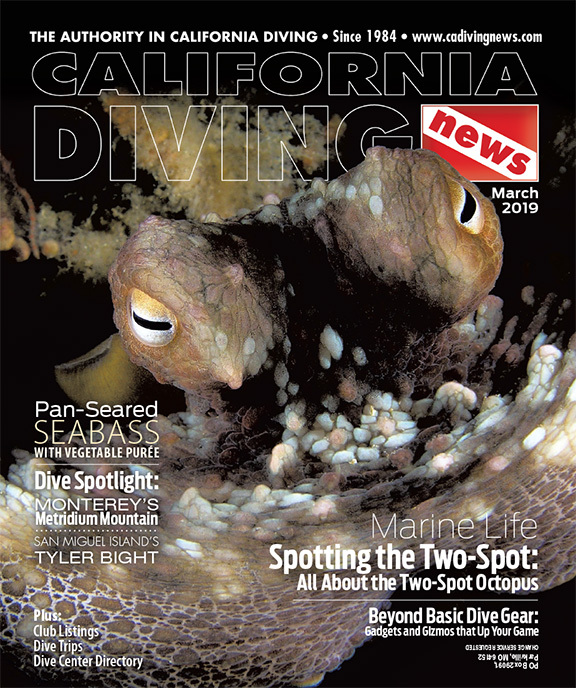 There are lots opportunities and places to make dives other than during the official cleanup. Dive Casino Point or Ring Rock early Saturday morning. Night dives are also possible. Snorkel Lover’s Cove before the awards ceremony. And if you make it a full weekend, on Sunday you can dive from one of several dive-charters operating out of Avalon. For lunch, do a little people watching from the seats that face the bay at Catalina Cantina. The food is reasonable and the place is always hopping. There are several good places to hang for Saturday night but my favorite is the El Galleon. Food is good and the karaoke is a riot. Diving for the cleanup is divided into three “stations”—Pier, Casino Point, and Steps Beach. If you can choose your station, I like them in the above mentioned order. The pier has the best overall “trash.” Jewelry finds here are not unusual. Other valuable items such as coins, wallets, and cellular phones are common here. But there are distinctive disadvantages to diving under the pier. Although water clarity is good at first, it usually goes bad quickly and stays that way. Boat traffic is common and unnerving. The area under the pier is small and becomes quickly crowded. Fortunately, there is a lot of space under the boats out into the harbor. The shallows get worked over heavily. Experienced cleanup divers head deep. Cleanup rules stipulate no diving deeper than 50 feet, but 50 feet takes you a long way out into this harbor. Also, by diving on the outer fringes you are more likely to encounter bat rays, halibut and guitarfish. The next best spot is the inside of Casino Point. Under the fuel docks and repair barge is good for tools, small outboards, batteries, old parts, etc. Visibility is also consistently best here. It would be tempting to concentrate just on attractive little discards but we must remember this is a cleanup to remove humankind’s damaging intrusion on Avalon Harbor. With that in mind, go after the trash that has most negative impact on the environment. Entangling plastics, for example, are bad news. Glass bottles are common and relatively inert. Be careful to not go overboard on bottle collecting. It is easy to overload yourself with a lot of heavy bottles. Bottles inhabited by a small animals, such as an octopus, Should be left alone. Keep an eye out for old bottles from the ’60s, ’50s, and sometimes earlier. To win any number of awards be sure to register all your odd trash finds at your station at the end of the dive. The “Silver-Tongued Devil” B.S. Award is the most coveted award. It goes to that participant who fabricates the most outrageous tale with regards to an artifact found during the event. I won the “B.S.” award a few years back for four words — “I saw a hammerhead,” spoken while I simultaneously held up to my forehead the old head of a hammer where the wooden handle had rotted away. Other past winners include those who have found the O.J. knife, Monica’s missing cigars, and various X-File stories. I’m sure somebody this year will find missing dimpled ballots from Florida. But the award originated from Ken Kurtis, co-owner of Reef Seekers Dive Co. in Beverly Hills. Ken was noted for his predisposition to telling post-dive stories that seemed almost impossible. The award is an actual petrified buffalo “chip,” painted gold, and mounted to a plaque. Here are some tips for winning the award: Keep it brief, very brief. Make your trash find the center of the story, not just a peripheral prop. Your story will work best if your trash find is unique, as such, you usually cannot plan your story in advance. With the good weather we have been having this winter, registration will fill up faster than ever. You MUST be registered to participate and you CANNOT register on the day of the event. For a registration form, call (310) 510-2595 or visit www.ccd.org on the web. 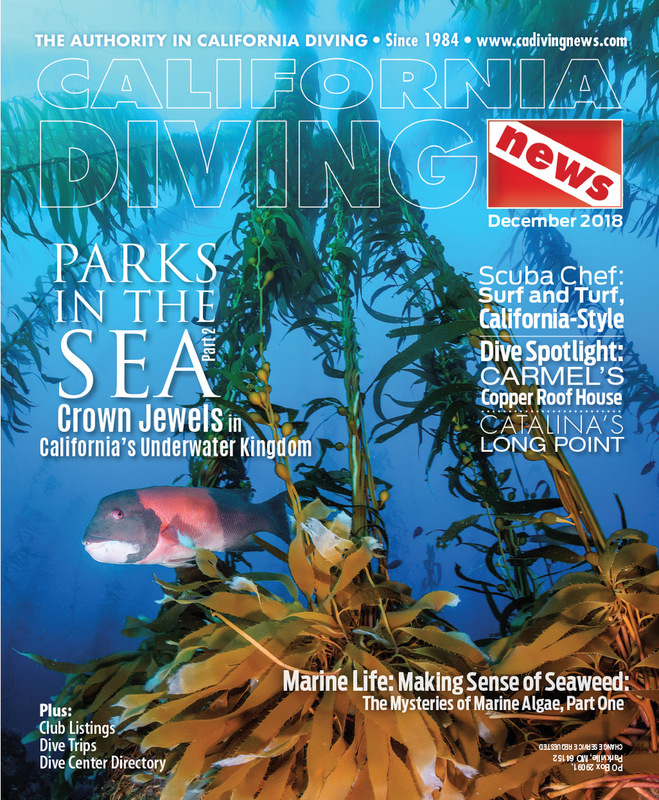 Proceeds from the Avalon Underwater Cleanup benefit the Catalina Hyperbaric Chamber and the Catalina Conservancy Divers.